How to create a home office that works for you? From full-time home-workers to occasional telecommuters to people who simply want to keep household paperwork in order and remove clutter from the kitchen table, a well planned home office can make all the difference. What type of work will you be doing in your home office? Do you need a table to write or draw in addition to the computer desk? What about a reading area? Will you have customers or colleagues visit you? This will influence your choice of space: closer to the door is better, and some extra seating will be useful, and might be necessary if customers will need to wait for you. What kind of materials do you need to store or have handy? How much paper do you produce and need to store? What essential equipment will you need and what extras would be useful? Computer is almost a given, and so is often a printer, but what about a landline telephone, shredder, and do people still use fax machines? What space in your home can you adapt for your office? Your mileage will vary depending on your circumstance, but if at all possible, create a space that’s clearly separate from the rest of your home. Ideally, you will have a room that can be used as a dedicated office space – a study of your own – but even if the room is to play multiple roles, find a way to delineate “your space” and ensure some level of privacy. If you don’t have a spare, or rarely-used room to utilise, consider less conventional solutions. The under-stairs cupboard: remove the walls and fit a built-in desk with shelves above and to the sides, making sure you leave enough space in the hall for people to pass without your needing to get up all the time. The upstairs landing might allow for a similar arrangement, often with the additional advantage of natural light from a window or a skylight. An alcove in a living room can be used for a fitted desk, and if it’s large enough you might be able to install a door, either to create a box room that will fit all you need, or to hide the office space once the work is done. Ruthlessly cull your clothes and transform a bedroom closet or a fitted wardrobe into a desk space. Installing a door if at all possible is definitely a good idea, as you don’t want to have the computer and filing in view when you’re trying to relax or sleep. If you are one of the lucky people who can spare a whole room (even a box room!) to be used for a proper study, it doesn’t mean you should fill it with random piles of paper on every existing surface. Get those files sorted and pack up out-of-date stuff. Storage is always the key to efficient use of the space, more so if the study might need to double up as an occasional guest room. If this is the case, consider getting a good quality sofa bed – this way you won’t feel like you are working in a bedroom, and you will have a space to relax or do some reading during your work day. Neutrals, such as white, cream and grey are the best foundation for your overall colour scheme. Use shades of neutrals tinted with other colours for larger areas like walls or flooring. 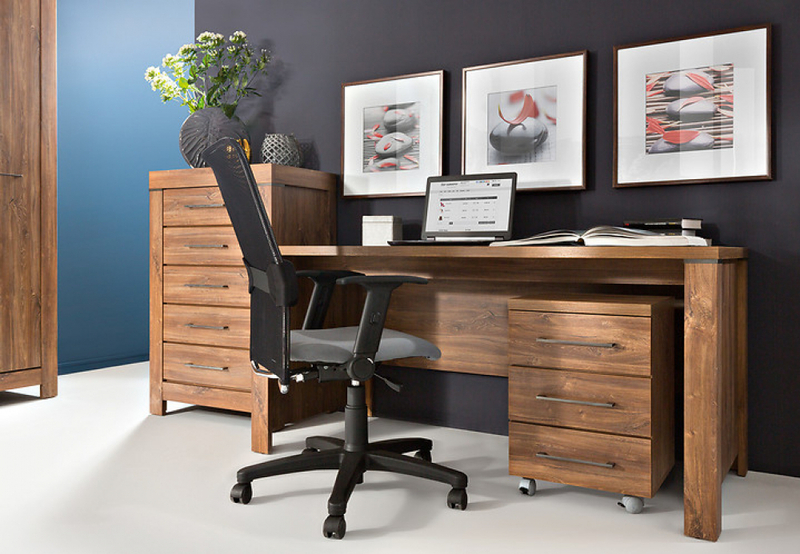 Combine the neutrals with stronger accents in other colours to create the environment that’s best for your home office. Cool colours, including blues, greens and violets tend to evoke relaxation and peace. Blue, known for making rooms feel cooler, can also make you feel sleepy. If you like blue, it’s better to keep it to accents rather than base a full colour scheme on shades of blue. Green is fairly neutral and invokes a restful, but fresh and focused mood. Consider also natural green: bring the outside inside with some plants. Purple is known for stimulating imagination and focused attention, so purple or lavender accents can help with creative work. Warm colours – yellows, oranges and reds – are all energetic, draw attention, create enthusiasm, excitement and stimulate activity. Too much of strong, warm colour can create agitation and even anxiety. It’s best to use them diluted, or as smaller accents, and if you want to raise energy levels in your home office with a stronger warm colour, yellow, reputedly improving perception and thinking, might be the best choice. Ultimately though, your preferences is what matters and you need to make sure that you feel good in the environment you create. Yes, creating an attractive space that feels good will make you more likely to spend time working, but not if your chair is killing your back and the positioning of your monitor is making your eyes strain. And those bold design schemes with vivid blocks of colour that look so good on Pinterest might get tiring after a while. It’s likely that you will do most of your work at a desk, sitting in a chair, and using a computer. Your work surface and chair will probably be the most important pieces of furniture in your office. The desk needs to be large enough, and of the right height. A computer table with a small surface area might work, but consider the space for spreading papers, reference materials, comfortable use of the mouse or even placing your coffee cup. If in doubt, go for a larger desk area. Custom-made or adjustable-height desks are ideal, but it’s the positioning of your body and your equipment in relation to its surface that’s crucial. The top of your screen should be at your eye level or a little lower. This way, as your eyes move down the screen, your eyelids will close a bit and moisten, reducing eye strain. Place your keyboard so that your forearms are parallel to the floor. Use wrist supports. Adjustable chair will make a lot of difference: position the seat so your feet are flat on the floor (or use a foot rest if you are too short to achieve it with your desk height). Your knees should be at the same level as or a little lower than, your hips. The back of the chair should be at a slightly reclined angle (100°-110°). Both lower and upper back should be supported. If you have limited budget, a good chair is one item you should not skimp on. Standing desks have recently become fashionable to reduce the time spent sitting down, but standing up for longer periods puts a lot of static load on the skeleton and is not any better. Unconventional seating solutions – including kneeling chairs, saddle stools and even sitting on a gym ball – can reduce the strain on the frequently troublesome lumbar region, but work best when used for short periods. It’s much better to use a well-designed, ergonomic chair that can be adjusted to a required height and get up and move at least a little bit, but frequently. If you feel that you have a natural tendency to sit for hours without a break, placing your storage areas slightly away from your desk, so you have to get up from the chair to retrieve paperwork, might be a little less efficient but beneficial for your health. Storage is probably the most overlooked part of a home office design, and the result is papers everywhere, and time wasted searching for important documents. Bookcases or shelves for reference works, pin board for urgent stuff that you don’t want to forget and yes, some form of in-tray/out-tray (which could be made of attractive baskets), and cupboard space for box-files or arch-lever files are all essential. Having a dedicated space for stationery supplies is also a good idea, even if it’s just one large drawer. You don’t need institutional-style filing cabinets, but you do need place to keep stuff you need regularly, and “piled on the desk” is not the ideal solution. There is a balance to be struck between having everything visible and within reach and drowning in clutter. Open shelves with compartments might offer a compromise here, but anything that stays untouched long enough to get a bit dusty should probably be filed away in a box in a cupboard. When at all possible, take advantage of natural light. Don’t place the desk facing a wall, as in an office cubicle. Put your desk close to a window, and ideally place it parallel to the panes. This will allow you to benefit from natural light – a mood booster which also helps to regulate sleep and promotes productivity – while glancing outside now and then will give brief rest to your eyes and reduce neck strain. If the window is flooded with sunlight at any time of the day, invest in blinds that will help your control the glare. If you have a choice, it’s better to choose a window that doesn’t face a busy street, as this can be too distracting. A peaceful view of the back garden might be more conducive to focus while still giving you micro-rests from your screen. Natural lighting will rarely be enough, though, so consider adequate artificial lighting that provides enough illumination but is well balanced to avoid eye strain. Overhead ceiling lighting is not sufficient and good task lighting (for reading, computer work, etc.) will make you less tired and more efficient. Table lamps can add a softer touch and introduce a pleasant decorative element. Despite more and more things operating wirelessly, you are still likely to have to deal with a lot – and I mean a lot – of cables. The unsightly tangle can be managed by placing a power strip behind your desk and plugging everything (in order) into that. And while at it, don’t forget surge protectors. While tidying your cables, it’s a good idea to identify everything with a tag, so you can plug, unplug and switch around things without having to trace each cable every time and accidentally unplugging devices. If you have enough room for a rest area or somewhere where you can read away from your desk, create such a space. A comfortable armchair, maybe with a with a foot stool to stretch your legs, a coffee table and a reading lamp will make you more likely to change your position and might inspire some creatively used breaks. As you are building a *home* office after all, add a quality throw or a decorative cushion to create a real comfort zone. One of the perks of working from home is being able to personalise your workspace. You don’t have to have family photos in silver frames on your desk (although go for it by all means if you want to), but artwork you like on the wall, or a board where you can pin a few personal pictures, can make your workspace more personal. You can also experiment with textures or styles, especially in the part outside of your immediate work area, which you want to keep as clear of distractions as possible. Ultimately, the best route to a home office that works for you is to create a space that you want to spend time in and in which you can work efficiently: functional and beautiful at the same time.